A brand new, exceptionally charming group of four houses located in the historic village of Kardamyli, which is situated in the Mani peninsula in the Southern Peloponnese. This traditional Maniot village is very well known for its spectacular views of the Taygetos Mountains and the Gulf of Messinia. 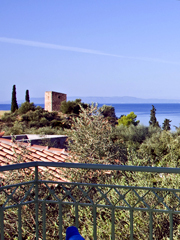 Situated at the southern end of the village above the traditional harbour, and nestled amongst the olive groves, Amoni boasts an enviable position with magnificent views out across the bay of Messinia and the surrounding olive groves which gives all our guests partial or sea views. The Amoni are two houses built in traditional Mani-style stone and wood, approximately 150 metres south of the village centre, a unique position that offers breathtaking views of the dramatic sunsets of the Messinian Gulf and total relaxation, within walking distance of the village. Owned by a local family who built The Amoni on land originally used by their great grandfather to afford hospitality to farmers from all over the Mani peninsula, they used this place as a stopover-resting place for their livestock on their way to the farmers market in Kalamata. Before the road to Kalamata existed, farmers from the Mani would normally spend days walking their livestock through the peninsula to Kalamata. Nowadays, it is owned by Alexandros the grandson, who carries on the tradition of hospitality along with the rest of the family. We would like to invite you to experience a place where time has stood still, a place where you can leave civilization behind and truly have an unforgettable and unique holiday. There are two houses to choose from: The small house is one storey with a studio layout whose separate bedroom leads off to the side (suitable for couples and small families), and the larger house is a two storey apartment layout (suitable for groups of friends and larger families) with two bathrooms, one upstairs and one downstairs. Both of these lodgings feature spacious living rooms (with sofa bed and TV), fully-equipped kitchenettes (with cooker-oven, fridge, kettle, toaster, iron, etc.) and very large bedrooms. Bedrooms have their own independent air-conditioning system and ceiling fan, living rooms have a ceiling fan only. Interiors are decorated tastefully, making it extremely comfortable and welcoming, and every villa has access to the garden. Fully-furnished, elevated verandas feature wonderful views, giving guests total privacy. A peaceful and luxurious accommodation which is recommended for couples and small groups of 2-4 guests. The houses are serviced twice weekly, with changes of bed sheets and bath towels. The Limanaki is just a short walk downhill from The Amoni, perfect for swimming in the clear, blue waters of the bay and snorkelling and exploring the small coves around the shoreline. Those who wish to explore a little further afield can drive through the Taygetos mountain range and forest, or to the Diros Caverns, the city of Kalamata, or to the Byzantine capital and restored citadel of Mistra. You can also take a short stroll to the restored old town of Kardamili to visit our small museum; there are also many hiking paths through the surrounding mountains to the smaller villages in the area. Kardamili is a fascinating Maniot village, rich in history and legend and folklore, and an ideal all-year-round destination. A discount is available for long-term stays. These lodgings are also available for long-term rental (3 or more months, from October to May), with utilities charged separately. We kindly advise guests to place their reservation well before high season. *Additional beds for children are available on request. Please kindly note that check-out is at 12 midday. Please note that a 25% to 50% deposit (payable by credit card or bank transfer) is normally required to book accommodation anywhere in Greece. Reservations are secured upon receipt, and confirmation of your specific accommodation, booking dates and deposit is then forwarded to you via e-mail/fax/post. This is standard practice. For information and reservations via e-mail, please use the enclosed contact form. We will reply within 24 hrs.